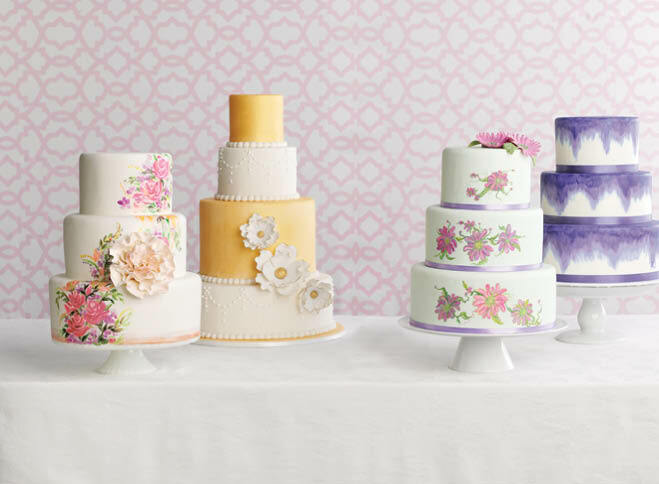 Vibrant brushstrokes adorn this three-tiered confection from Rolling Pin Bake Shop, creating a fresh, watercolor-inspired floral design. A blush sugar flower complements the hand-painted blooms and smooth cream fondant coating. Guests will swoon over the fine detail in this Brookfield Wedding Cakes creation. Edible gold paint covers alternating tiers and edges the glamorous gum-paste flowers. Varying sizes of layers lend an extra air of drama, while dotted piping adds a timeless touch. This Creative Confections cake catches the eye with playful hand-painted flowers in vibrant shades of pink, violet and green. Atop the cake sit impeccably crafted sugar daisies, mirroring those on the tiers below. Soft shades of purple cascade down each fondant tier in this cake by Craig’s Cake Shop. Brushed to a subtle ombré effect, these watercolor washes call to mind the tranquil flow of water. These one-tier wonders, draped with the most festive of florals, show you don’t need layers to make a statement. Mix divine décor with creative confections for a dessert bar that serves up sweets in style.